Loren Mackenzie has overcome many obstacles in her life to be an elite professional cyclist in the Women’s World Tour in Europe. Known as the Ice Queen of the peloton, she rarely shows emotion in the heat of competition; inspiring her team with quiet strength and determination. But her cool confidence masks a dark past filled with horrors. A change in management of Loren’s cycling team brings her face to face with a life she thought she left behind, adding to the pressures of competition. When a chance meeting with an A-list celebrity quickly develops into a whirlwind romance, the cameras of the tabloid-media focus on Loren, revealing the cracks in her facade. The affair also exposes a menacing rival, threatening not only her chances in the World Championship but her life. When love and obsession collide, Loren stands in the center of a storm. Can she find the courage to defeat her inner demons, or will her fear and shame consume her? FREE from March 12-16 only! Atherton Leaves Her! Has the Actor’s Whirlwind Romance with the Pro Cyclist run its Course? Loren Mackenzie knew the headline in The Sun was an exaggeration, but the World Champion time trialist still felt the sting. As her pro cycling season draws to a close, Loren looks forward to taking a break from training and a reuniting with her boyfriend, Graham Atherton. When rumors and innuendo begin to swirl around them, secrets they have kept from each other shake their relationship to its foundation. Echoes from the past ripple into the present, giving Loren a bittersweet reunion with a love she thought was lost. But, reliving the fractured memories of her childhood has left her afraid to dig deeper; lest the monsters that dwell in the dark corners of her mind drag her down again. 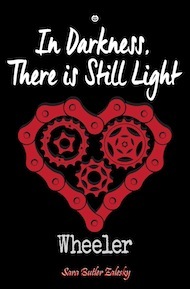 Loren must find the strength to believe that even in darkness, there is still light. There is still hope. There is still love. The following is the first chapter of In Darkness, There is Light. It’s not over. It’s not. Loren Mackenzie let out a sigh, her eyes following the blinking lights of a jetliner as it disappeared into the distance over Kennedy International Airport. He’s just going back to work in California and I’m going home, to England. She let out an even longer sigh. Just two more races and I get to take a real break. How perfect would it be to just go lie on a beach somewhere with him. Her gaze refocused on the reflection of a man approaching her in the window; his long, confident stride and athletic form quickened her pulse. She turned to face him, but her smile dissolved into a hard frown when he was stopped by a group of fawning teenagers, begging for autographs and selfies with him. Yep, I had to fall in love with an A-list actor. As Graham Atherton separated himself from the group to continue toward her, Loren forced a smile, but it didn’t stick as he stopped again to become engrossed in his mobile. He looked up from the screen to continue on his way. “That’s nice of him to offer.” She turned back to the window as Graham came up behind and wrapped his arms around her. “No, darling, you’re not just tired,” he murmured. “You’ve been completely shat on.” He kissed her neck then tightened his arms around her. “You won the time trial Championship in Richmond, but you had to put up with all the nonsense from the press. 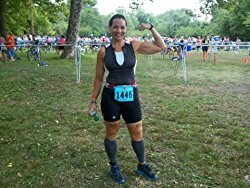 And then losing the road race, which even that BBC reporter, Theo Arnold agrees was not your fault.” Graham came around to face her with pinched brows. “But if that weren’t enough, you had to deal with me throwing your past in your face.” He cupped her cheek. “I still feel awful for that, and I want to help you, but I have no idea how.” Loren kissed him, then put her arms around his waist and held him close. “Grab your bag and come with me.” He bent to pick up their carry-ons, then led her to a private seating area, far away from prying ears and eyes. He took a seat on the small sofa across from her and held her hand with both of his. “Is that all?” she chuckled softly. “Here I thought you wanted to have a quickie or something.” His stare was somewhere between being shocked and wanting to laugh; his laugh won. “I love you.” But his mirth it died out as his bright blue eyes studied her. “I have a present for you, and I wanted to save this for your birthday, but it’s burning a hole in my pocket.” He removed a small red velvet box from his jacket and her jaw dropped. He leaned in closer, smirking. “I’m not asking; I’m giving. That’s all.” Her hands shook as she took the box and opened it. Nestled inside was a platinum ring of two clasped hands holding a red stone shaped like a heart, capped with a crown. “You don’t have to say anything, love. The stunned look on your face says it all,” he chuckled, but her eyes welled up. “Well, yes and no,” he countered. “It belonged to my great-grandmother, so I’ve had it for a while, but it needed to be resized. It’s a complicated process, you know.” She kissed him then moved off his lap to the sofa but kept her legs draped over one of his. “It’s beautiful. Thank you.” She settled her head on his shoulder, breathing in his scent and grazing her lips against the scruff on his jaw. “I don’t want you to go,” she whispered. She squeezed her eyes closed to hold back the tears. I miss you already. Loren sighed. “I need to talk about all of this with my brother, my real brother,” she replied. “I need to find him.” Graham moved back to see her, his mouth curled down. “Yah, I can wait. Hell, I don’t even know where to start looking,” she grumbled, and he kissed her forehead. “I do love nothing in the world so well as you,” he murmured. “Je connais,” Loren whispered, sliding her arms around his neck and kissed him. Most of these stories have never been shared, let alone completed. This all changed in the spring of 2015, when Sara was encouraged by a friend to expand upon a short story she had accidentally emailed to him. 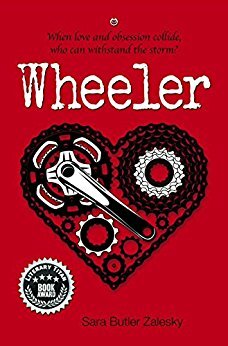 The result is ‘Wheeler’, a romantic, women’s fiction/sport novel, which combines the author’s romantic inclinations and her passion for cycling.